Our comb wallet is designed to keep up to 10 combs safely organised and swiftly to hand. It's made from tough, water-resistant canvas with strongly stitched pockets ranging in size from 1 to 5.5 cm to hold anything from a pintail comb to a super giant waver. There's an opaque plastic flap that folds over the top of your combs to keep them safe and a strong velcro strap to keep the whole wallet securely fastened. 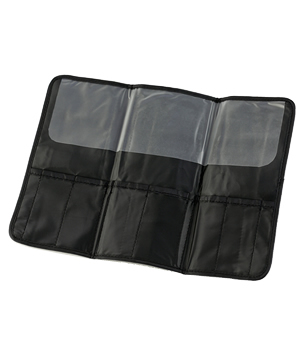 The CoolBlades Comb Wallet is 24.5-cm high and 11.5-cm wide when closed. It opens out to 34-cm wide.